Day Two in the Search for Miss World Canada 2018 was spent at our hotel home-base getting head shots and glossy photos of all the delegates. Every single entrant in this year’s competition sat for a live in-person interview with judges, after recording a ‘canned’ video introduction. This was certainly a good day to look your best, and be mindful and amazing as there were cameras everywhere and the live interviews could make or break each delegate’s campaign. What made the day even more important was the famous photographer Erwin Loewen shooting portraits of the pretty ladies in an old Cadillac out front of the hotel. Bystanders walking through the complex on Monday July 23rd probably couldn’t see beyond the fashion models and photo-shoot setups on site to comprehend what they were truly witnessing: a fashion model-making machine at work manufacturing fifty six different looks, and jet-propelling fifty six careers (fifty-seven if you count Erwin’s). Everything appeared rather random, but in fact was well planned and well assembled by experienced professionals who’ve been doing this for many years now, and they really know their craft. All parts of this day will be recorded for posterity on video, and in still photo collections; all the delegates today were cogs in a well-oiled machine. This is a beauty factory. This is what it looks like. Introductions. One by one, each delegate is given an opportunity to introduce herself on camera. This clip you see being recorded below will appear in the video (if its good enough, otherwise it will be redone elsewhere) that will play before a live audience (and webcast) Saturday night. This lady nailed it on the very first take. The Beauty Factory has many parts and pieces as subjects move through the system like an assembly line. First the delegates get their hair and make-up done by no less than twelve professional makeup artists. These beauticians unpack whole apothecaries of vials and jars on their tables, organized into rows of powders, paints, sprays and scents. Some of these artists sit their subjects by the window, while others use ring lights to illuminate each face. The entire 2018 ensemble passed through the beauty department that morning, in groups of ten. The models are done in small groups to reduce stress on the beauticians and thereby let them turn out better work. Each make-up artist has the proper amount of time, makeup product and light and comfort to work and make each delegate look (and by extension – feel) her very best in the upcoming trials and tribulations of the day. Hair stylists – each delegates’ hair is coiffed to their satisfaction. Look at this image below from the factory floor. Clothing stylists select garments from the stash that each delegate brought from their own homes. Today the call was for denim shorts and tank tops and each delegate presented her limited selection to the stylists on hand who helped her select and streamline the desired look. The stylists were tasked to work with what was available, and that was usually only three or four different choices as most ladies are living out of a single suitcase. It was heartening to see some girls sharing clothes before the shoot and the stylists encouraged such switches both for camaraderie, and to make the best possible 2018 photos collection. Once the delegate was done with hair and makeup and her clothes were themed correctly she posed for a picture against the photo wall in a specially lit area. This picture-perfect setup shot is added to the official pageant media pics, but is also used by the makeup company for their records. Upstairs and out of sight there’s still more media being made. The ladies in the lounge here are waiting for their turn under the bright lights in the video Introduction chamber, and for their interview with Judges. From what this author understands there are two or more components to the interview portion of the pageant. The first part, which is probably the easiest encounter even though it too is very demanding, is done on video. Fernando the MWC video editor asks each subject a list of prepared questions which the delegate answers (after introducing herself, again). Then I believe Fernando himself selects the best and most interesting reply to put in the video, and that sound byte is very important. It colours each judge’s perception of the person behind the face. It will also live forever in the video and online. These delegates will each show their children this day, and that one answer answer that Fernando selected will define their appearance in the pageant in many ways.. But the second part of the process is more demanding. Live interviews happen in the Emerald Room upstairs before a panel of elite Judges who are very experienced selectors of the right stuff. This glimpse is the only record we have of what actually happens upstairs in that particular boardroom where the interviews happen, so secretive are the members of this select committee of judges. The first part that is done on video will be in the movie that’s displayed to thousands of people at the end of the week. That media will live forever, and so maybe that is the more important (and stressful) of this two-phase opportunity. The hotel lobby was the central square and primary meeting ground and central conduit in the beauty factory. Clean Meals delivery Toronto came and left behind over a hundred delicious home-cooked meals. The driver came and went without any fanfare or popup banners or posters or any fuss; he left behind a dozen stuffed black bags filled with trays full of fresh cooked gourmet food under wraps on a nearby table which as you can imagine became a very important place for the next few minutes. 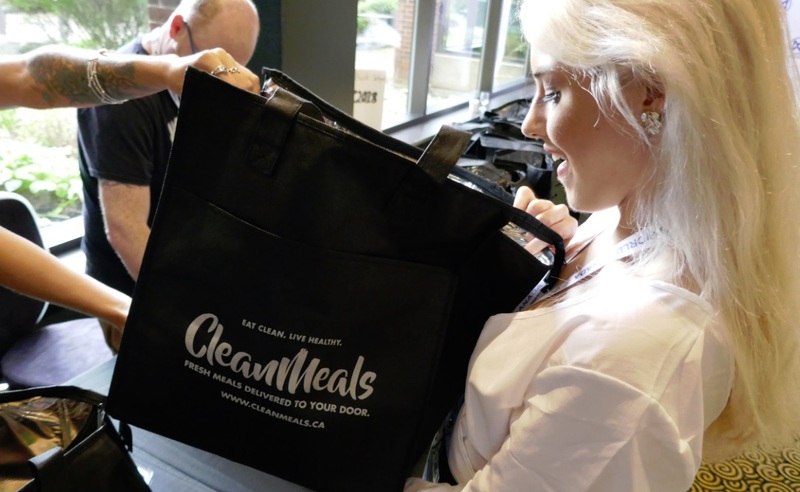 Clean Meals makes these nutritionally balanced gourmet meals from organic, locally sourced ingredients and delivers them direct to their member’s door, or in this case, to a table near a pageant rehearsal ballroom. 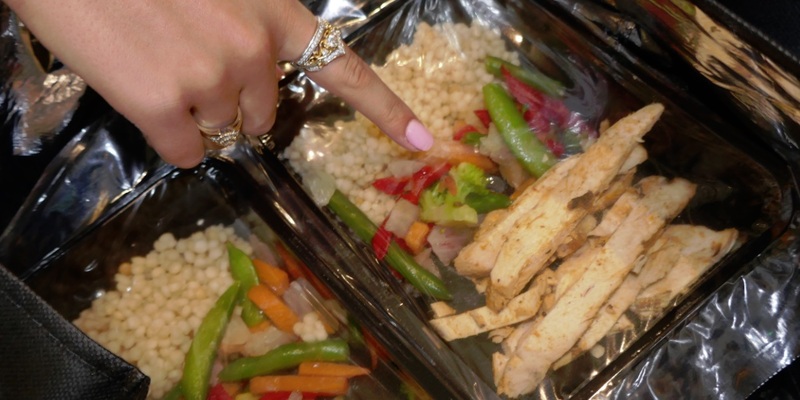 Above is a bejeweled finger selecting herb chicken on couscous with steamed mixed vegetables for lunch. Just look at those spring peas, red pepper strips, carrots and broccoli! This is good healthy food for our athletes. The lunches (and dinners later that day) provided by Clean Meals were fresh and flavourful, and the aroma of this delicious meal filled the hotel and even closed down Erwin’s beauty factory for a few moments. Although we ordered ‘Clean Meals’ for sixty people, lunch and dinner, the company could have provided enough food for the entire week, or whole month, or year. This organization will even design your diet, and your family’s diet, preparing special meals for weight loss or for competitive training, and they deliver anywhere within the Greater Toronto Area (and beyond). Everyone enjoyed their Day Two lunch and dinners enormously, and we cannot thank Clean Meals enough for this generous donation. 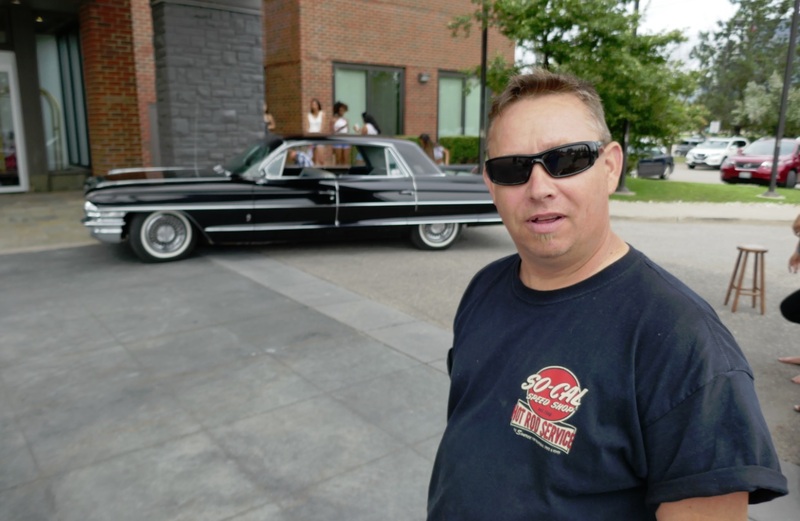 Chris Stapley of Stapley Automotive in Campbellford, the owner of the black Cadillac was quick to reply when told the car would soon be famous. He laughed and said, ‘the car is already famous’. The black car in our photo shoot that day is a 1962 Cadillac series 60 Fleetwood purchased new by Chris Stapley’s grandfather (in 1962) at Addison Cadillac in Toronto. The car is still in its original unrestored condition. It has a 390 engine, V8 hydromatic transmission, and a photo-friendly black&white leather and cloth combination interior (with tear wood panels unlike modern vehicles). This is a four door hardtop with power windows, seats and trunk. It still has the original Wonderbar radio and only 40,000 miles. Here’s Erwin Loewen using the backseat of the car as a perfect photo background and studio. The pictures he made that day contrast the old car’s luxury with our young fashion models’ faded denims and tanks. The two motifs juxtapose each other (old car vs young model, and denim vs luxury interior) and the dichotomy excites viewers’ interest as their human brains subconsciously or maybe even consciously ponder an explanation. This is magazine quality fashion photography full of classic references, juxtapositions and rich visual stimuli. Erwin Loewen is a talented photographer. His images captured each delegate on Day Two of the Search for Miss World Canada, and each portrait is a perfect high-fashion presentation that’s certain to be included in their modelling portfolios going forward. These images could land any of these ladies bigger and more exclusive modeling opportunities in Toronto, Montreal, New York, Los Angles, or Paris or Milan. Beauty is a universal language. Angelopedia put Erwin’s pictures to work the very next day in Angelopedia online gallery of the 2018 Miss World Canada delegates alongside each contestant’s name and title. Above is the end-of-the-line in the beauty factory. This is where the magic happens.